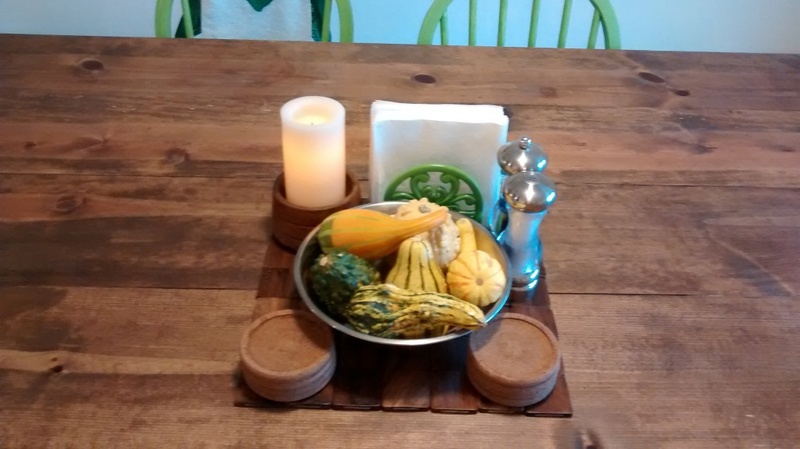 It wouldn’t be November without a bowl full of gourds. Reminds me of growing up. Weekly Happenings: After a crazy week last week (due to Halloween), I think all of us were more than ready to take a breather this week. We hung around the house, being pretty lazy. I didn’t even take that many pictures. The Weekly Weather: It was good that we wanted to hang around the house and not do too much, because the weather totally cooperated. Early in the week it was cool, but then mid-week, fall finally hit. It was cold, rainy, and windy. I think it rained for over 24 hours, almost continuously. Friday and today brought back cool but sunny weather. What Paul’s Been Up To: School and work, mostly. On Wednesday, it was voting day and he was stuck going after he got done with work. He was there for over an hour waiting in line. Poor guy. Especially since that’s when it started raining. Luckily he had thought ahead and had his umbrella. This morning, we were talking about making a bench of some sort to put on the porch to put decorations on (and to hide wires from Halloween and Christmas lights) as well as act as a place for people to remove shoes outside if shoes are super dirty. We were out and about, so we stopped by Lowe’s to get supplies. He had a picture in his head and knew just what to get and how much. He then built it in a matter of a bit over an hour. I’m so grateful that he has that talent! What Sarah’s Been Up To: I had a much easier time voting on Wednesday, since I had the advantage of being able to go in the middle of the day. The only interesting thing that happened there was that two people got into a semi-heated discussion about whether or not veterans were getting the benefits they deserved (one guy was a veteran and the woman he was having the discussion with worked for the V.A. as a counselor of some sort). 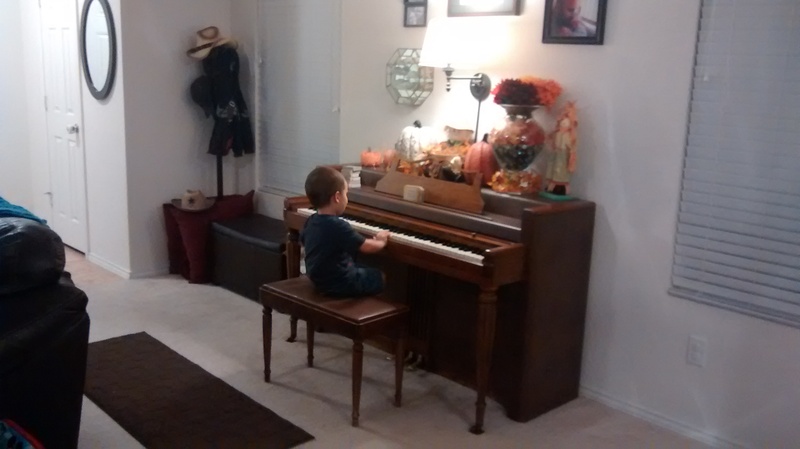 Other than voting day, it was just grocery shopping, house cleaning, and piano teaching as normal. What Joseph’s Been Up To: Using superlatives…often. When he see’s something he likes, it is automatically his favorite thing. He’ll say, “Oh, it’s my favorite car!” or “That’s my most favorite shirt, ever!” He’ll also ask if something of ours is our favorite thing. It’s pretty funny. 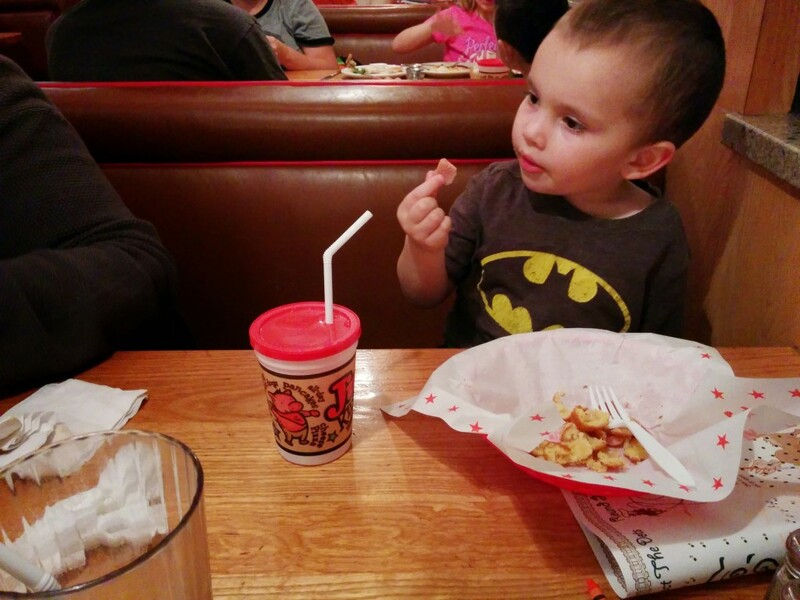 Munching on his corn dog at Jim’s (there are certain days that kids eat free). 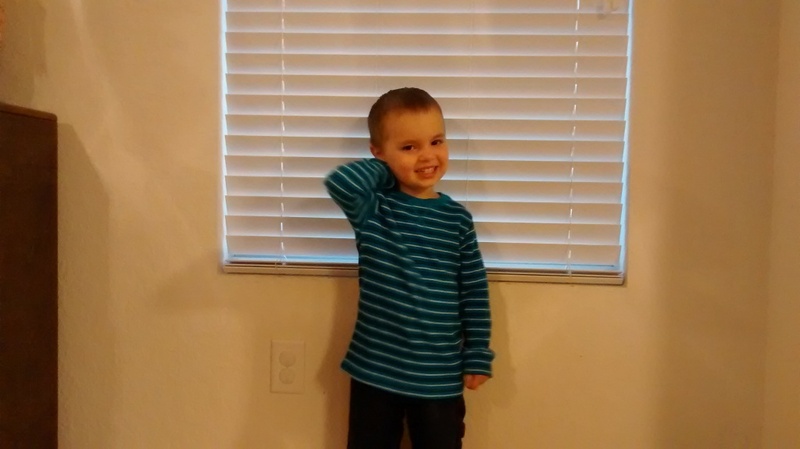 He was excited that he got to wear his striped shirt on one of the rainy days. 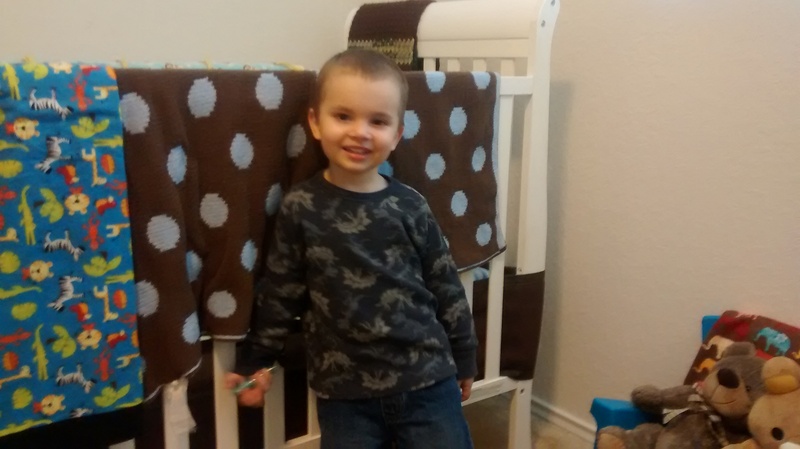 But he says that his dinosaur shirt is his “most favorite shirt, ever” and he pretends to be a dinosaur when wearing it. 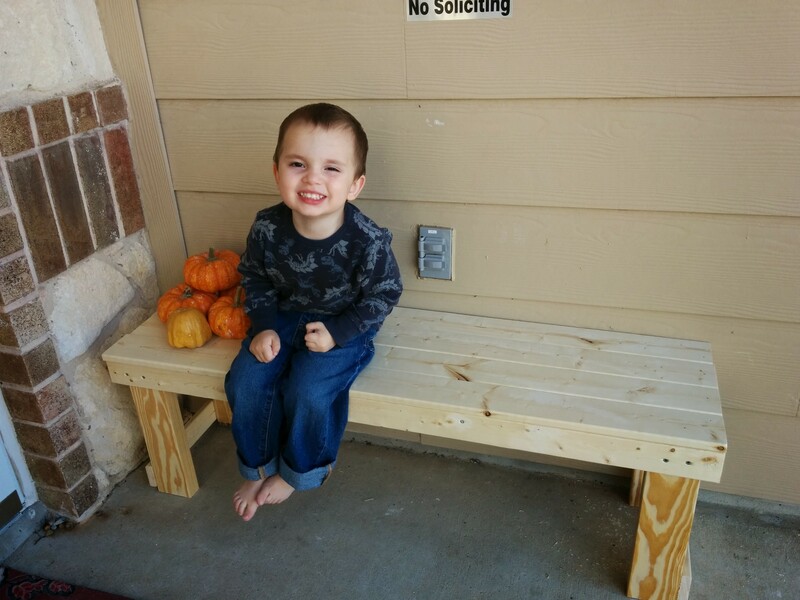 Joseph testing out Paul’s completed bench. Paul says he may eventually stain it.